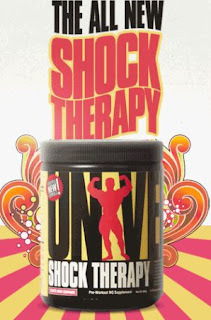 A "pumping" all-in-one pre-workout powerhouse, the all new Shock Therapy does away with flat, lifeless workouts and zero motivation and drive. Combining patented ingredients and proven performance compounds in a delicious, mouth-watering formula with cell volumizers, energy substrates, focus agents, a new creatine complex, antioxidants and more, this comprehensive supplement will give you powerful pumps and lock you in the zone and help you dominate in the gym. Click the link below to get a sample.